Posted on October 13, 2016 by thelostlighthouse	in Comics, Literature and tagged comic books, comics, comics reviews, Dead No More, Literature, Marvel, Marvel comics, Peter Parker, Spider-Man, superhero comics, superheroes, The Clone Conspiracy, The Lost Lighthouse, TLL. I wasn’t sure The Clone Conspiracy would be the best comic to pick up, considering the patchy track record the original Clone Saga had. For those who don’t know, the Spider-Man Clone Saga is infamous for being needlessly overly convoluted, and lost Marvel a fair few fans. They’re going down the clone route again, which is a bold move with the attached stigma, but if they can pull it off Marvel can do justice to what the Clone Saga should have been. 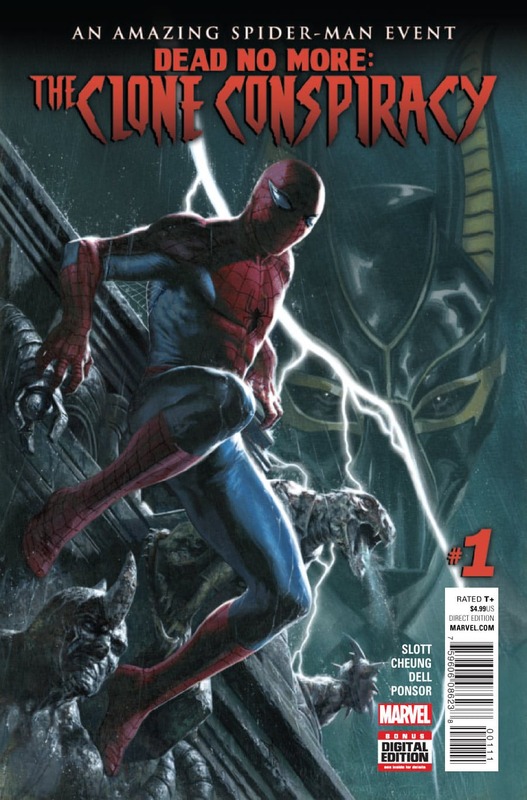 Issue #1 (I’ll skip the whole title as it’s very long…), written by Dan Slott, pencilling by Jim Cheung, inks by John Dell, colour art by Justin Ponsor, lettering by Joe Caramanga and cover art by Gabriele Dell’otto, kicks off The Clone Conspiracy with the funeral of Peter’s Uncle-In-Law J. Jonah Jameson Sr. From here the plot rapidly picks up with Peter investigating an apparent miracle cure he convinced his Uncle-In-Law not to take. It doesn’t take long for something to smell awry and the conspiracy to begin. The first one at least. Something I really enjoyed in this issue – Peter himself. I was a huge fan of the Animated Series as a kid and it really feels like this was the same Spidey. He’s wise-cracking, hot-headed at times, but ultimately a good guy who’s trying his best to do right by everyone. This level of character consistency can be rare in comics, especially when dropping in to a new story arc without any of the background. The art is outstanding. The characters look fantastic, Dell and Cheung’s work really paying off. Ponsor’s colouring captures the mood, adding darker tones and secrets are revealed and the conspiracies are uncovered. The fight scenes are packed with detail, and the lettering expertly draws your attention across the panels, building the atmosphere. As for downsides to the issue, it is a little slow to fully get going. This was useful in a way for someone like myself who’s getting back into things but the story could have been streamlined. The big question though, can the artists successfully draw hands? It’s true that I’ve already said the art is outstanding, so that may be a little bit of a spoiler here. The hands are of course drawn well as part of this. If I’m being picky one women’s hands look like they’ve blurred into one in one of the group shots. Hands throughout the issue are used to convey a lot of emotion, as shocking things are discovered. 9/10 for hand drawing skills! 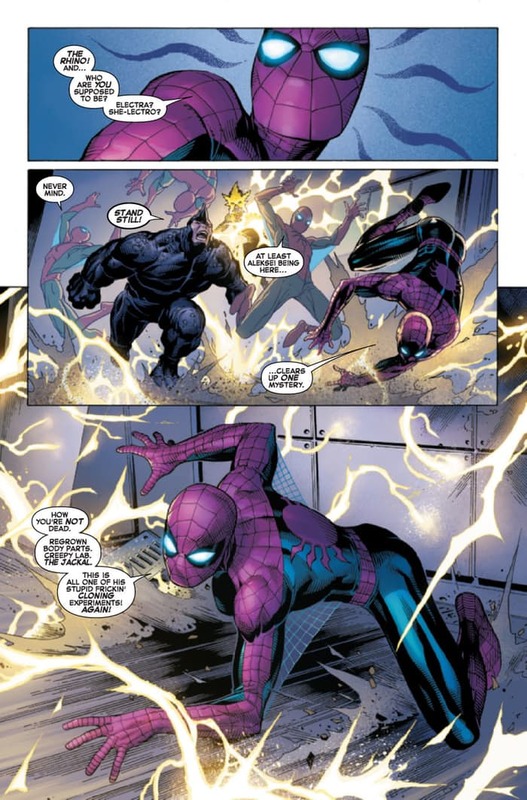 I like the twist, I’ll save that for you to come across yourself when you read this issue (you should), it mixes up The Clone Conspiracy and things are not looking like a rehash of the Clone Saga.